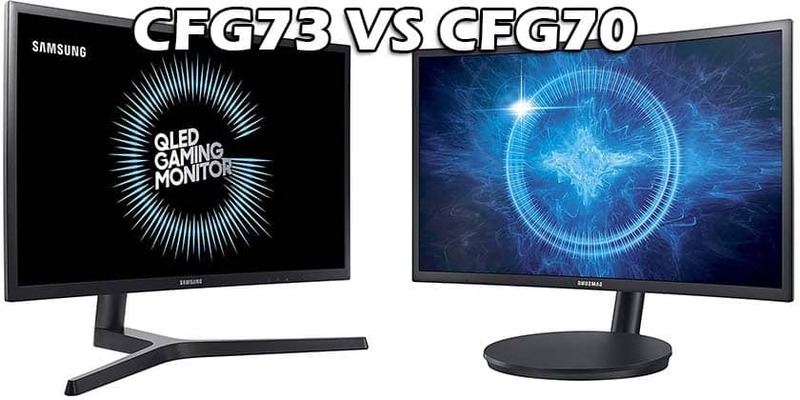 The Samsung CFG73 monitors (Samsung C24FG73 and Samsung C27FG73) are the updated models from the previous Samsung CFG70 series (Samsung C24FG70 and Samsung C27FG70). In essence, these are all almost identical 1080p 144Hz 1ms (MPRT) VA-panel curved gaming monitors. The CFG73 series fixed (some) issues with flickering and purple artifacts associated with the CFG70 models. Moreover, the CFG73 monitors have an upgraded stand, but no RGB lighting technology. The Samsung C24FG73 monitor is based on a VA panel with quantum dots which allow for the extended color gamut covering over 125% of the sRGB color space. In addition to the superior 3,000:1 static contrast ratio and a decent 350-nit peak brightness, the monitor delivers an immersive image quality with vibrant and bright colors with prominent black shades. While the 1080p screen resolution may be too low for some users, it does provide a decent amount of pixel density on the 23.5″ screen of the monitor. So, there’s a reasonable amount of screen space available, details are sharp, and more importantly, it’s not very demanding on your PC system. In fact, when it comes to the image quality, the Samsung C24FG73 is the best 24″ 1920×1080 monitor available. There’s minimal backlight bleeding and no dead pixels while the 178-degree wide viewing angles cause only minor shifts in contrast when the screen is looked at extreme angles (far from the sides or far from below/above). 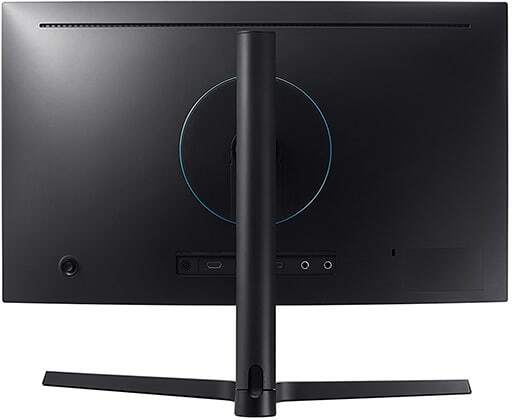 The C24FG73 Samsung quantum-dot monitor has an impressively low input lag performance of around 4ms which makes for imperceptible delay between your actions on the results on the screen. Furthermore, once you set the Response Time setting in the OSD (On-Screen Display) menu to ‘Faster’ or ‘Fastest’, the monitor enables the 1ms MPRT technology which via backlight strobing further reduces motion blur and ghosting in fast-paced games. Alas, in darker scenes where there are a lot of dark pixels involved, some smearing is apparent but to a tolerable degree. So, if you’re looking for a 144Hz monitor for competitive gaming, you’d still be better off with a TN panel display though then you wouldn’t have nearly as good image quality. Keep in mind that the motion blur reduction technology also reduces the maximum screen brightness though at ~230-nits, the picture is still quite bright. If you haven’t yet experienced the 144Hz refresh rate, you’ll be amazed by the extra fluidity and responsiveness it brings to fast-paced gameplay. Note that many CFG73 models still suffer from the flickering issue of the CFG70 series. 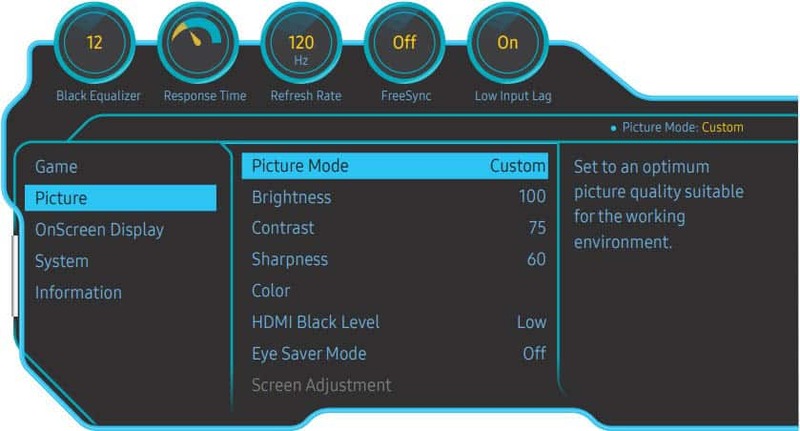 While AMD FreeSync is active, some CFG73 units will have horizontal lines/flicker at the bottom of the screen. In video games, it’s not that noticeable, but for desktop use, it is bothersome forcing you to disable FreeSync when not gaming. The CFG73 also supports AMD FreeSync but with a rather limited dynamic range of 70-144Hz. As long as your FPS (Frames Per Second) rate stays within that range, there will be no screen tearing or stuttering. In case your FPS rate drops below 70, the AMD LFC (Low Framerate Compensation) technology kicks in and makes the display’s refresh rate double or triple the frame rate which in turn maintains the gameplay fluidity by eliminating most of screen tearing and stuttering. Note that you cannot use AMD FreeSync and the 1ms MPRT technology at the same time. 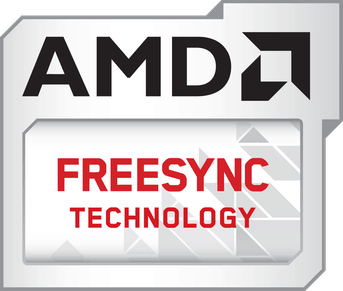 For FreeSync to work, you will need a compatible AMD graphics card or an Xbox One/S/X console. You can use the monitor with NVIDIA cards and PS4/Pro as well, but won’t benefit from the dynamic refresh rate. Update: FreeSync now also works without any issues when using a compatible NVIDIA G-SYNC graphics card. However, on some panels, some tearing and (black) flickering may occur when using FreeSync with NVIDIA cards. To remove it, you will need to power cycle the screen. 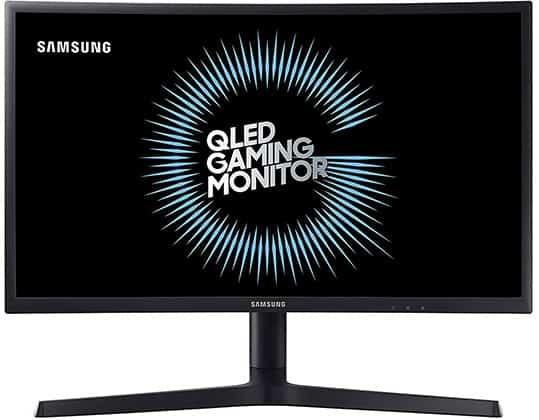 The Samsung C24FG73 23.5″ monitor is equipped with plenty of gaming features in addition to FreeSync and the motion blur reduction technology. In the user-friendly OSD menu, you will find pre-calibrated picture presets for FPS, RTS, RPG, and AOS gaming genres. You can also save your own settings in three Game Setting profiles. Next, by enabling the Black Equalizer feature, you can increase the visibility in dark games as the dark areas of the image get brighter. There’s also Low Input Lag Mode which by bypassing certain image processing further reduces input lag. 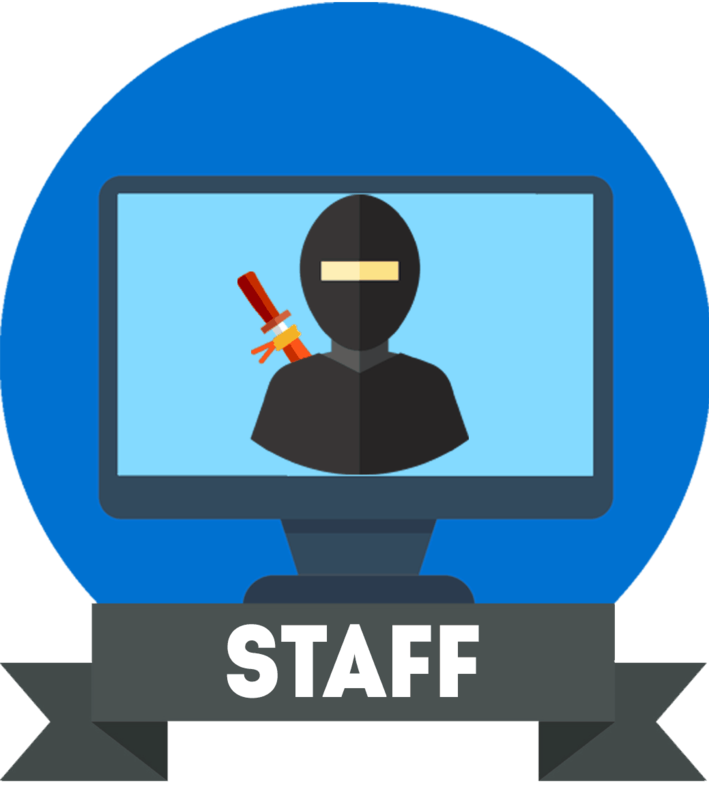 The monitor is factory-calibrated, it has an integrated harmful-blue light filter, and it’s flicker-free when not using the backlight strobing technology. The Arena Lighting RGB technology is not available on the CFG73 models, but the new stand is much better. You get full ergonomic support including up to 135mm height adjustment, -/+ 15° swivel, -3­°/20° tilt, 90° pivot, and 75 x 75mm VESA mount compatibility. Connectivity includes two HDMI 1.4 ports, DisplayPort 1.2, and a headphones jack. 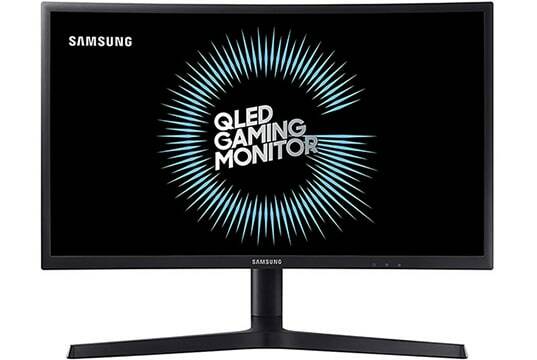 The Samsung C24FG73 price amounts to around $300 which makes it one of the most expensive 24″ 1080p 144Hz monitors, but it’s also one of the best due to the quantum dot technology. On Amazon, you’ll also find the 27″ CFG73 model, but we recommend the 24″ version as it has a higher pixel density and therefore, a crispier image quality. 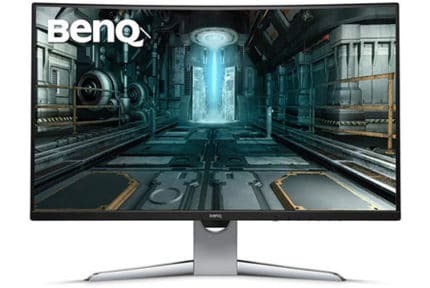 Considering that there are no 24″ 1080p 144Hz IPS monitors, the Samsung C24FG73, the AOC C24G1, and the MSI Optix MAG241C are your best picks if you want both an immersive image quality and a smooth 144Hz performance at 1080p. Both the AOC C24G1 and the MAG241C are considerably cheaper than the CFG73, but they don’t offer quantum dots. However, the MSI MAG241C does offer saturated colors (115% sRGB) while the AOC C24G1 has a basic 100% sRGB color gamut. 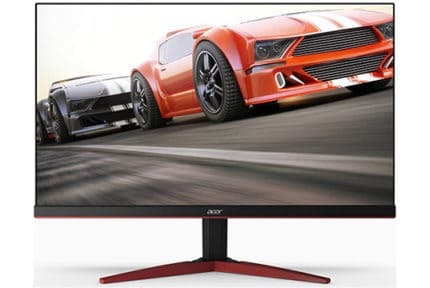 Furthermore, both AOC’s and MSI’s models also have a motion blur reduction technology as well as a wider FreeSync range, and they are not prone to flickering issue as the CFG73. The Samsung C24FG73 is the best 24″ 1080p 144Hz gaming monitor if you want both a smooth gameplay and a vibrant image quality. However, for mainly competitive gaming purposes, a TN-panel 144Hz gaming monitor is still a better choice as it has less ghosting. Alternatively, you should check out the MSI MAG241C and the AOC C24G1 which may not have as a wide color gamut, but offer overall better value for the money. The Samsung C24FG73 is one of the best 24" 1080p 144Hz gaming monitors. It offers vibrant colors thanks to the quantum-dot technology and a smooth fast-paced performance thanks to the 1ms MPRT. Moreover, it's got a great design with versatile ergonomics and plenty of features. Its FreeSync range is very narrow though which may put off some gamers.